1. 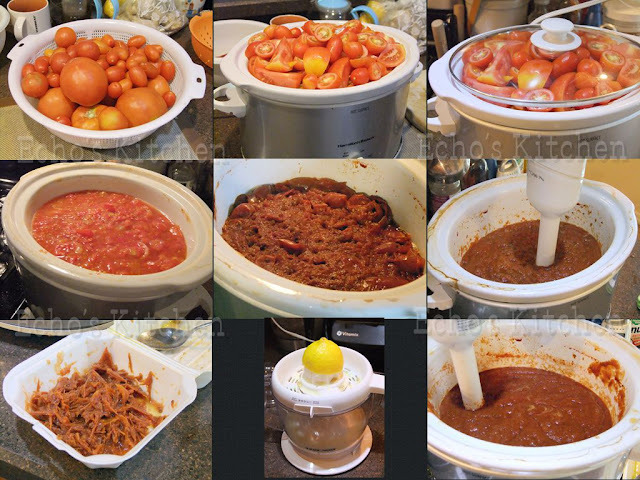 Clean and air dry the tomatoes, cut out the core and chopped the tomatoes, fill the crockpot to the brim. (Note：I have way too many cherry and small roma tomatoes that it would have taken me forever to skinned them. 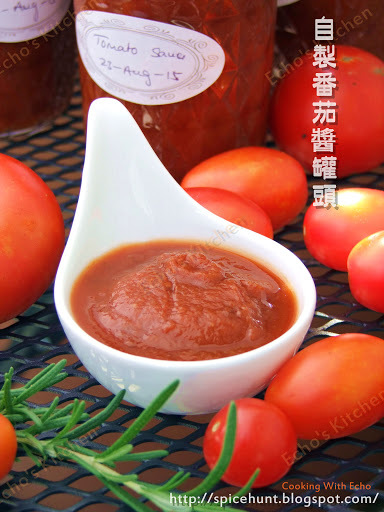 If the variety you use is large ones, you can scald the tomatoes and remove the skin before chopping, this will save some work later and gives much smoother result in the paste）. 2. Cook the tomatoes at high for 2 hours, when the tomatoes become soft and releases liquid, use a potato masher to break the tomato down as much as you can. 3. Continue cooking at high for 6-8 hours (I let it cooked overnight), the volume of the tomato will reduced to half in the morning and the color darkened. 4. Using a handheld blender/Immersion blender to blend the tomato into paste. The tough skin of tomatoes will start getting stuck to the blender head at this point of time, I will use a tweezer to remove it and discard, repeat this until nothing get stuck anymore. If the tomatoes were skinned before cooking this steps wouldn't be necessary. 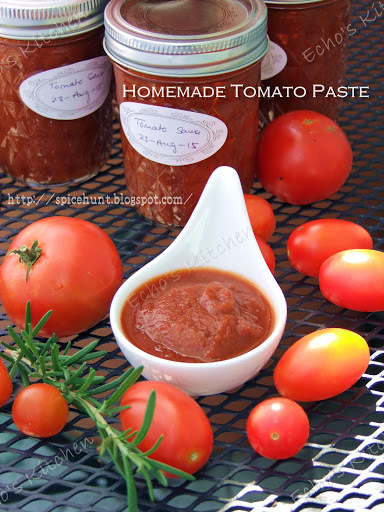 Note：if you want a smoother paste/sauce, strain the blended tomato paste through a sieve to get rid of remaining tomato skin or seeds. 5. Squeeze out 1/4 cup of lemon juice and add it to the pot and stir well, continue cooking for another 30 minutes. 6. Fill the stockpot with over half a pot of water (the water should be able to cover all cans later when boiled). 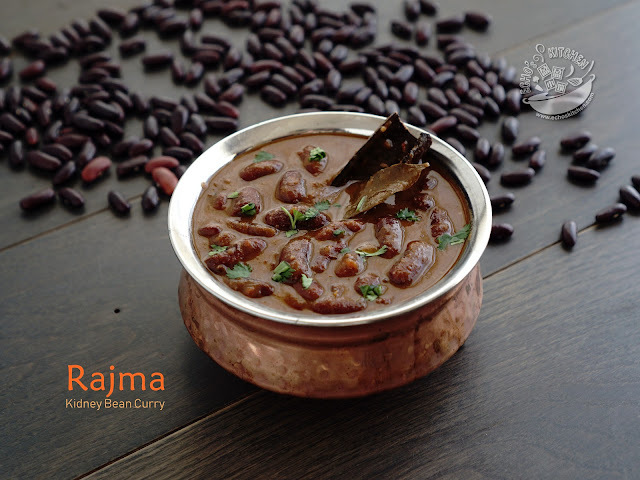 Bring the water to boil and turn the heat to low to maintain temperature. 7. 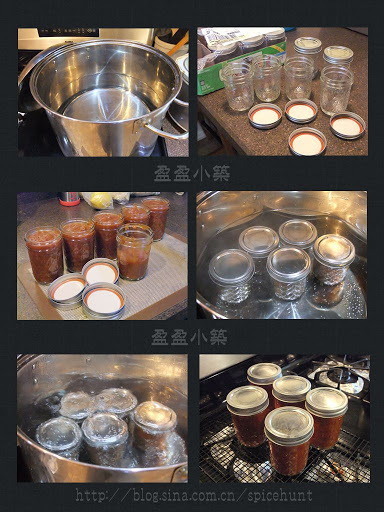 Fill the jars with tomato paste before the paste become cold, the high temperature in paste could help to raise the temperature of the jars and prevent temp shock that could crack the jars when placed into hot water later. Remember not to fill the jars too full, leave 1-2 cm of space in the jar for expansion during boiling/water bath process. 8. Put the lids and rings on, screw them to finger-tight, slowly lower and place the cans into hot water with lid side up using a canning tong/canning jar lifter. Wait for few minutes before turning the heat up. Cook the jars in boiling water with lid on for 35-40 minutes. 9. Lift the jars out and let cool on a rack, when the jars cooled down to room temperature, the cans are ready to be stored at cooled dry place such as pantry. The cans can be stored for 1 year if unopened.